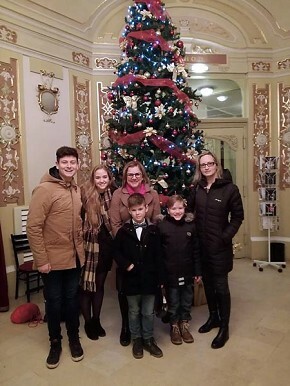 I met up with Argentinian exchange student Joaquin Vitor Swarez at the Košice State Theater where we saw Luskácik (the Nutcracker) ballet. Pictured here are Joaquin Vitor Suarez, Lauren Maheu, Jana Janotková, Lukaš Janotko, Denisa Sklenárová, and Radovan Sklenár. This last month has definitely gone by the quickest. I’m not sure whether it’s due to the winter days being shorter or the seasonal activities that have been keeping me busy, but it’s crazy to think that it has already been four months. With January approaching, I’m patiently waiting for the “real winter” everyone is telling me about. Though it doesn’t snow much in Košice, there have been a few mornings with what looks like a winter wonderland outside my window. There’s not quite enough to play in, but any snow is enough for this Floridian! It certainly has gotten colder and I’ve been assured that the temperature will continue to drop after the New Year… so, snow for my birthday? I hope! In Slovakia, the holiday spirit started spreading early with Mikuláš (Saint Nicholas) coming to town on the evening of the 5th. Children clean their shoes and leave them on their windowsills in hopes that Mikuláš and his angels will bring them sweets for being good children. If you have been bad, the devil (who also accompanies Mikuláš) puts coal in your shoes instead of candy. Thankfully I got sweets! On the Day of St. Mikuláš (December 6th) people in school even dress up like angels and devils! This tradition was a nice reminder of the religious roots associated with this time of year, making it all the more special. Christmas markets are also very common throughout Europe; selling traditional food, hot drinks, and souvenirs, in stands lined up along main streets or town squares. Here in Košice, we have two, but I have also visited one in Bratislava and in Vienna with the other exchange students in the Czech Republic and Slovakia during our Christmas meeting. Though at the meeting we had language tests which added a bit of stress to the weekend, it was an amazing time spent together, listening to music with dancing as always, ice skating, touring Vienna, exchanging Secret Santa gifts, frosting ginger bread cookies, and of course, taking more group pictures with our flags! In the weeks leading up to Christmas, excitement for the holidays faded, but my schedule remained full with invites to the Košice State Theatre [x4 Luskáčik (The Nutcracker) ballet was my favorite], the opera, and even a Slovak reggae concert. As you can tell, I’ve really embraced the arts this month! It wasn’t until after school got out for the winter holiday that I began to think about the festivities, which were bound to ensue sometime soon. Before I knew it, lights were hung outside houses, stromčeky (Christmas trees) were decorated with ornaments, and gifts were wrapped. (Christmas) in Slovakia was of course different, but each new tradition made it that much more memorable. Here, they celebrate it on the 24th of December. For dinner we started by having a piece of garlic and with honey for good health along with oblàtka (thin, circular wafers), then moved on to Kapustnica (traditional cabbage soup), and finally, a main meal of fish and potato salad. After dinner, a bell is usually rung, symbolizing the presence of gifts under the tree (pun intended). Santa doesn’t exist in Slovakia; instead, Jeiško (baby Jesus), is the one who delivers presents to children. This is another example of how the religious origin of Christmas is maintained in Slovak celebration. Traditionally, the youngest member in the family distributes the gifts, and once presents are all opened, Christmas movies are watched, specifically Popelka (an old, Czech rendition of Cinderella) and the classic, Sam Doma (Home Alone). Just when I thought the festivities were over, we got dressed and headed to the city center for midnight Mass in the St. Elizabeth Cathedral. Despite being away from home and missing all that the holidays bring back in Florida, my Christmas in Slovakia was just as merry! In these last few days leading up to the New Year I’ve been embracing the Slovak winter and trying some things that aren’t quite possible in Florida—sledding, making snow angels, and skiing! It must’ve been interesting to see someone who struggles to just walk in snow, try to gracefully glide down it without 1) falling, 2) skiing into someone, or 3) propelling downwards at a dangerously high speed, unable to slow down… It’s harder than it looks! Thankfully, my host dad was there to act as a road block and keep me from sliding down uncontrollably. After about four hours of having numb shins and seeing my life flash before my eyes repeatedly, I think I got the hang of it and managed to go home in one piece! Though in Slovakia, New Years Eve is called Silvester based on the Slovak name day calendar, everything else is pretty similar to how it is in the U.S. Our night/morning here, consisted of the typical fireworks, sparklers, and glasses “cheers-ing” for health and happiness in the new year. Being an exchange student has allowed me to see how this celebration is essentially the same all around the world. We all started 2019 at a different time, but all in the same way! With that being said—Šťastný Nový Rok!